A Southwick man spent Christmas behind bars after providing false information to police in relation to a speeding offence, police said. 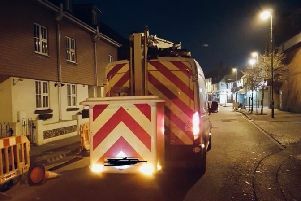 On 29 May 2017, a white Ford Focus which was travelling at 36mph in a 30mph zone activated a speed camera in Ditchling Road, Brighton, police said. A Notice of Intended Prosecution (NIP) was sent to the registered keeper in Hove, but no response was received, according to police. Therefore a new NIP was sent to Colin Drewitt-Barlow at an address in Sompting on the basis the vehicle was insured to him, police confirmed. A reply was received stating Drewitt-Barlow no longer resided there, and further enquiries led to another NIP being sent to his new address in Coleman Avenue, Hove, said police. The 31-year-old, unemployed, and now of Downsway, Southwick, replied and nominated another person, however this proved to be a false name and address, confirmed police. In police interview, Drewitt-Barlow denied driving the vehicle when the offence was committed or ever owning it, police said. The case was then submitted to the Crown Prosecution Service (CPS), which authorised a charge of perverting the course of justice. Drewitt-Barlow pleaded not guilty but later changed his plea to guilty at Lewes Crown Court on 12 December 2018, police said, where he was sentenced to three months’ imprisonment. He was also ordered to pay a £115 victim surcharge, added police. Sussex Police launched Operation Pinocchio in 2016, aiming to improve safety on Sussex’s roads by tracing and prosecuting offenders who provide false information in an attempt to avoid prosecution. It also aimed to prevent law-abiding motorists, who have been badly advised, from committing serious criminal offences by attempting to avoid speeding or red light offences, police said. The offence of perverting the course of justice carries a maximum term of life imprisonment, added police.